Gross Area: 39,070 sq. ft.
Area Per Student: 112 sq. ft.
Meeting the needs of three year olds, four year olds and young five year olds in an invigorating environment, the new ECEC is the result of interactive visioning with the community and district. The 39,000 square-foot school includes 18 classrooms, a cafeteria, a full-service kitchen, a multi-purpose room, and offices for Community Education and Enrollment Services. Also included is a dedicated space for children with special needs, a secure welcome center and an adventure playground. 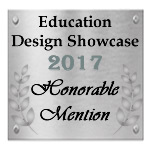 The innovative design includes porch entries that offer home-like first impressions as children arrive, allowing parents to walk children directly into school and interact with teachers on a daily basis. Learning studios offer open and stimulating environments that are accented with color and natural light. 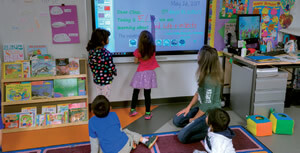 Keeping young learners in mind, designers utilized all available surfaces. The floors are used as often as the tables. Three collaboration areas within the main circulation spine denote class neighborhoods, a gross motor development center, and the dining commons. Display walls in these areas feature student projects and announcements. The students and their work take center stage in this facility. Previously, the early childhood program was dispersed at multiple locations throughout the District at the Community Education Building, in a portable classroom at the middle school, at an elementary school, and at the high school. The parent-funded, tuition-based program had more applicants than their facilities could accommodate. The new facility expanded the District’s program to accommodate an additional 50 to 100 students. In addition to the Early Childhood program, offices for Community Education and Enrollment Services were relocated to the new building. This building has allowed all of these functions to come together under one roof and serve as the District’s first point of contact for new families, making enrollment even easier and comfortable for families already used to the building and environment. Integrating these programs has proven to be successful for the District. 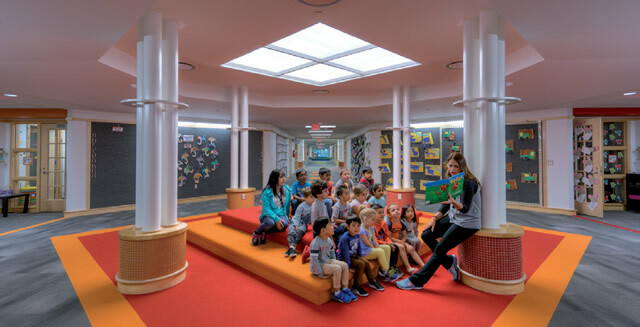 Designers provided an intimate, smaller school setting that fosters collaboration. 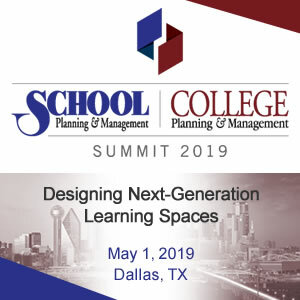 The team attended a national early childhood conference to learn more about how facilities can positively impact social and academic development. Team members and district personnel toured and benchmarked similar projects nearby, noting what worked and what did not. Modern learning was integral to the design of this Early Childhood Education Center. It is rich with technology and flexible furniture. All furniture, fixtures, and signage were designed to fit small learners. Color-themed areas allow children to visually navigate the building with ease. The school is organized in four different houses. Each house contains four learning studios in which the students are able to freely move throughout using sliding doors. These glass doors also allow natural daylight to reach interior classrooms. The entire facility supports the district’s approach to Preschool Creative Curriculum. Houses have individual porch entrances that give a home-like first impression as children and families arrive. Each house has an identity, articulated by an accent color indicated through paint, interior and exterior signage, and flooring. In order to increase instruction time, each classroom now features its own restroom, as opposed to students having to go down the hall. Each classroom also has a child-sized sink and drinking fountain. The design team integrated custom signage and graphics throughout the building to promote learning and instill young Wildcat pride. Cohesive signage throughout the building teaches topics such as nutrition, hygiene, and the four seasons. 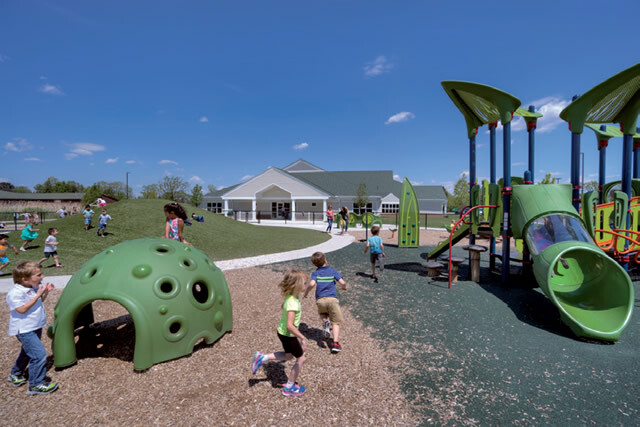 Knowing how important free play is to mental development, designers also incorporated multiple spaces for indoor play and a large outdoor playground to enhance teaching and learning. The playground features multiple play areas including a popular, central synthetic turf hill. As an added bonus, the playground is open to the community for after-hours use. Staff comfort was also considered in this facility. To show appreciation to the staff, the district requested a new dedicated space for teachers to collaborate, relax, and regroup. All furniture and interior materials were chosen based on durability and ease of maintenance. Flooring choices of carpet, Luxury Vinyl Tile (LVT), and rubber are low maintenance and have a lower life-cycle cost than other options. These flooring choices also have the added benefit of acoustic dampening, a much-needed attribute with early childhood learners. Velcro compatible wall displays eliminate the need for sharp tacks. Natural wood tones are highlighted throughout the facility, adding to the welcoming and residential environment that designers were aiming for. Flexible casework and furniture allows each teacher to make their space work for their needs. The new building is situated on an educational campus with district offices and two elementary schools. Security and traffic flow concerns were addressed through the integration of individual porch entrances for each house section of the building. Parents are able to park their vehicles outside their child’s porch and use an assigned key fob for building entrance. This design disperses parking along the length of the building and eliminates the typical congestion found with one main entrance. Visitors to the building are granted access through a secure, main vestibule that can access the early childhood center as well as adjacent offices. 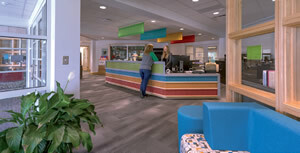 The Community Education and Enrollment Services area feature two distinct but connected office suites with two waiting spaces. The district and team had the advantage of history for this project, having worked on multiple projects together and utilizing a tried-and-true process. Past successful projects helped designers learn which products and processes the client preferred. Close collaboration between the design team, construction manager, and program manager kept the project on budget and on schedule. An accelerated design schedule allowed for adequate bid times, allowing the District to take advantage of an optimal bidding climate. Schedule adjustments allowed for a reduction of the construction cost. Thanks to a solid team effort, this unique learning facility is already making a big difference for the kids and the community. It has become a welcoming front door to the district and is nearly at capacity. Good use of color for wayfinding and identifying spaces. Use of fobs for parents’ entrance is a well-thought-out idea. Transparency of the interior is a nice touch.